The Chicago Hearing, which was held on April 18, 2010, by the American Friends Service Committee (a US Campaign member group) under the title "Does U.S. Policy on Israel and Palestine Uphold Our Values?" (see our previous blog entry here) has gained its own Wikipedia entry. So far the article includes sections on: the context of the Chicago Hearing, the witnesses who testified at the hearing, plus academic and religious members of a Listener Panel who asked questions of the witnesses, topical discussions that included our own National Advocacy Director, Josh Ruebner, speaking on U.S. military aid to Israel (view that presentation on our web site), and the conclusions of a detailed final report that is freely accessible. The JNF continues to serve as a global fundraiser for Israeli ethnic cleansing, occupation and apartheid. The JNF and its affiliate organizations enjoy charitable status in over 50 countries. Join us in revoking the charity status of the Jewish National Fund. June 5 Coordinated action in solidarity with the people of Beit Nuba, Imwas and Yalu, the villages that existed where the JNF-built Canada Park now lies. Read the call for action. Click here to download the Stop the JNF Campaign fact sheet, presentation materials and a poster. Soon we will be shedding our winter clothes and wearing our T-shirts outdoors again. Now is the time to order your U.S. Boat to Gaza T-shirt! You will be helping the campaign raise the last money needed to sail The Audacity of Hope to Gaza in Spring 2011. Wear your T-shirt out and about in the U.S. and let people know that you support this effort to break the illegal Israeli naval blockade of Gaza to end the collective punishment of 1.5 million Gazans and the occupation of Palestine. You will be standing up for International law and standing with the U.S. Boat To Gaza, "The Audacity of Hope," a nonviolent mission for universal human rights. Please also take a moment to join our newest effort, TO GAZA WITH LOVE, a letter-writing campaign from people like you in the U.S. to the people in Gaza in an act of friendship and solidarity. We hope you will spread this request throughout your community and help us succeed in collecting thousands of letters from all over the country. Wear a U.S. BOAT TO GAZA T-shirt in the coming months, as the boat launches and sails. Write a personal letter, send it to us and we will carry it as our cargo on The Audacity of Hope. Thank you for your continued support. Together we are making it possible for The Audacity of Hope to reach the shores of Gaza soon. Purchase a shirt that will help support the U.S. Boat financially and wear it often to spread the word far and wide about the U.S. To Gaza Campaign. The writer of this letter to the editor is our very own Mike Coogan, the US Campaign's Manager of Finance and Administration, speaking on behalf of only one of hundreds of congressional districts throughout the United States losing money that they "don't have" for a military occupation that is claimed by Republican Congressman Eric Cantor to not exist. Recently a delegation of 12 Virginians and I had the opportunity to meet with Rep. Eric Cantor's office. A member of our group expressed our main concern. Our "ask" was that Cantor use his position of leadership to ensure Israel respects the human rights of Palestinians and pursue a strategy that could end the Israeli occupation. The legislative director responded: "We don't refer to it as an 'occupation.'" Rep. Eric Cantor addresses AIPAC conference. Not an occupation? Is there Internet access in this office? The occupation has been going on for 43 years. It seems Cantor formulates policy like a child who hopes that putting his hands over his eyes will make the boogey monster disappear. Furthermore, if it's not an occupation, then there is probably no reason for the United States to give Israel $30 billion of military aid in the next 10 years. The people of the 7th District of Virginia deserve an explanation as to why our district is paying an estimated $73 million to provide weapons to the Israeli military over the next nine years. As Cantor has said, "We believe this government must stop spending money that it doesn't have." We agree. Perhaps he should start by cutting funding for an occupation that he doesn't think exists. Most people I have met would rather spend that $73 million on tax breaks for small business, investments in higher education or paying down the deficit. Instead, we're subsidizing Israel's illegal occupation and gross human rights violations. Here's a detailed analysis of current boycott discourse from more than one angle. It discusses one of our member groups, Jewish Voice for Peace, whose director, Rebecca Vilkomerson, recently spoke on a panel devoted to the boycott-divestment-sanctions (BDS) movement, at the annual conference of J-Street, which generally opposes BDS. TO BOYCOTT or not to boycott? That is the question that growing numbers of American Jews on the left wing of the pro-Israel community have reluctantly and uneasily begun to ask themselves in recent months. After initially categorically rejecting the movement to boycott, divest from, and sanction Israel (or BDS, as it has become known)—a movement launched in 2005 by a coalition of Palestinian civil society groups that's now a global campaign—progressive pro-Israel groups and individuals are now starting to reconsider and revise their position. They are not—at least not yet—embracing BDS, but they are for the first time giving it serious consideration and debating it merits. The clearest sign yet of this new willingness to discuss what was previously off-limits occurred during a recent conference organized by J Street, the self-described "pro-Israel, pro-peace" lobby group. Holding its second annual conference in the cavernous Washington Convention Center (also the site of the yearly conference of AIPAC, J Street's much larger and richer rival), J Street included a panel session entitled "Who is Afraid of the BDS?" Among the speakers was Rebecca Vilkomerson, the director of Jewish Voice for Peace (JVP), an organization that advocates the boycott of companies that profit from the Israeli occupation and has been labeled by the Anti-Defamation League as one of the top ten anti-Israel groups in the United States. Her inclusion was noteworthy in itself, but what made the panel even more remarkable was the fact that it was conducted in a calm, reasonable manner, free of diatribes and invectives. In other words, it was completely different from the way in which discussions of BDS usually take place in the American-Jewish community. Instead of assailing the legitimacy of BDS in principle, the discussion focused on the efficacy of BDS—can it help promote an end to the Israeli occupation and a two-state solution? The large audience that packed the room (people were even queuing outside to get in) listened calmly and intently and asked the panel earnest questions. To hold a rational and civil debate on a topic that until now has been hugely inflammatory for American Jews and Israelis is quite an achievement for J Street. Even more commendable is the fact that it took place despite fierce criticism of J Street for including JVP—an organization that is shunned and vilified by the mainstream American-Jewish community— in its program. Contrary to the accusations of its critics, by allowing BDS to be debated at its conference, J Street did not embrace these controversial tactics (it continues to oppose BDS). Rather, J Street has asserted that BDS is a subject that cannot and should not be ignored by the American-Jewish community. By upholding the values of freedom of speech and inclusive dialogue, J Street is insisting that grappling with the pros and cons of BDS does not in itself delegitimize Israel or deem one to be an anti-Zionist. As such, J Street is helping to break the BDS taboo in the American-Jewish community in general and among progressive pro-Israel activists in particular. 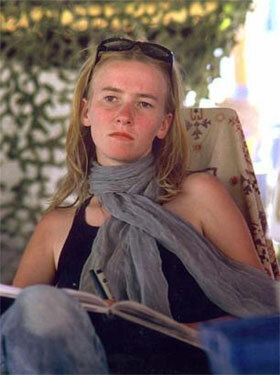 (Haifa, Israel – March 29, 2011) – After a five month recess, the Haifa District Court will resume hearings Sunday, April 3, in the civil lawsuit filed by Rachel Corrie’s family against the State of Israel for her unlawful killing in Rafah, Gaza on March 16, 2003. Rachel was an American student activist and human rights defender who was crushed by a Caterpillar D9R bulldozer while nonviolently protesting the demolition of Palestinian homes. The commander of the unit that killed Rachel is scheduled to testify. Known to the court as S.R., he oversaw the bulldozer work from an armored personnel carrier at the scene. While numerous military witnesses in the case have been permitted to testify behind a screen to protect their identity – a highly unusual security measure – S.R. is expected to do so in the open because his identity is already known to the public. The civil trial began over a year ago in March 2010 with testimony from four of Rachel’s colleagues from the International Solidarity Movement (ISM), who witnessed her killing. In a second phase that began on September 5, the government presented nine witnesses who included the lead military police investigator in the case and the driver and commander of the bulldozer that struck and killed Rachel. Following is a remarkably thorough and statistics-heavy op-ed published in today's Register Guard newspaper (Eugene, Oregon) by Jack Dresser, PhD, who is national vice chairman of the Veterans for Peace working group on Israel/Palestine and co-director of Al-Nakba Awareness Project, one of 339 member organizations within our coalition. Nicole Trobaugh as Rachel Corrie. Lord Leebrick Theatre Co.'s production of "My Name Is Rachel Corrie" recently ended, ably directed by Carol Dennis with Rachel's role well-performed by Nicole Trobaugh. We thank the theater for staging this important work, now translated into some half-dozen languages and staged in over a dozen countries to date. We agree with Craig Weinerman's March 9 guest viewpoint that more context for the events leading to Rachel's death was needed, and we provided some basics on one-page handouts to theater-goers at each performance. On the first two nights our handouts corrected misinformation on the theater's website and playbill, which managers agreed to remove after speaking with the Corries. Following this, what Weinerman described as our "aggressive and defamatory anti-Israel advocacy" on new handouts included the mission statement of the International Solidarity Movement with which Rachel worked, which describes itself as "a Palestinian-led movement committed to resisting the Israeli apartheid in Palestine by using nonviolent, direct-action methods and principles." In a rare late-night session, the Knesset has finally adopted two obnoxious racist laws. Both are clearly directed against Israel’s Arab citizens, a fifth of the population. The first makes it possible to annul the citizenship of persons found guilty of offences against the security of the state. Israel prides itself on having a great variety of such laws. Annulling citizenship on such grounds is contrary to international law and conventions. The second is more sophisticated. It allows communities of less than 400 families to appoint "admission committees" which can prevent unsuitable persons from living there. Very shrewdly, it specifically forbids the rejection of candidates because of race, religion etc. – but that paragraph is tantamount to a wink. An Arab applicant will simply be rejected because of his many children or lack of military service. But far worse is a third law that is certain to pass its final stages within a few weeks: the law to outlaw the boycott of the settlements. As it stands now, the law will punish any person or association publicly calling for a boycott of Israel – economic, academic or cultural. "Israel", according to this law, means any Israeli enterprise or person, in Israel or in any territory controlled by Israel. Simply put: it is all about the settlements. And not only about the boycott of the products of the settlements, which was initiated by Gush Shalom some 13 years ago, but also about the recent refusal of actors to perform in the settlement of Ariel and the call by academics not to support the so-called University Center there. It also applies, of course, to any call for the boycott of an Israeli university or an Israeli commercial enterprise. This is a fundamentally flawed piece of legislation: it is anti-democratic, discriminatory, annexationist, and altogether unconstitutional. Since last December this blog has been keeping tabs on a situation in Seattle, Washington, where activists affiliated with at least two of our coalition member groups paid for large billboard ads on the sides of public metro buses, demanding an end to U.S. military aid to Israel, only to have the transit authority later crumple under a backlash of anti-Palestinian pressure and reject the ads, based on supposed public security risks. Our coverage has included: a post by our National Advocacy Director, Josh Ruebner, on the absurdity of local authorities' stated fears over running the ads, a news report from Seattle KING5 News during the hight of the controversy, and fantastic newspaper op-eds by Ed Mast, of the Seattle Mideast Awareness Campaign, and Peter Miller, of AUPHR and the US Campaign. Our latest is a post we found at Slog, by guest blogger Howard J. Gale, PhD, a Seattle research psychologist, peace activist, and member of the Seattle Jewish community with family and friends in Israel. Gale's story exposes an apparent act of bias and blatant censorship on the part of local government. When King County Executive Dow Constantine decided on December 23 to pull contracted Metro bus ads stating "Israeli War Crimes—Your Tax Dollars at Work," I wrote a letter, signed by over 46 members of the Seattle Jewish community, questioning that decision. During a 50-minute meeting with Constantine on January 10, he made it clear to me that the decision to ban these bus ads was based on his belief that there were serious threats—based on hard evidence—to the safety of passengers and Metro drivers. I was left with the conclusion that fear generated by serious threats of violence, rather than pressure from advocacy groups, was the central factor in his decision to pull the bus ads. Two months later I must reassess this conclusion based on evidence revealed (1) in the February 14 Federal Court case brought by the ACLU against King County for First Amendment violations, and (2) in the documents released to me by King County in response to a request under the Washington State Public Records Act. I have learned a few things from going through the first batch of 6,702 documents. First, the number of emails that shaped Constantine's decision to pull the ads has been grossly overestimated by King County, based on the fact that: (1) 1,369 of the documents are junk files of random characters; (2) many individual emails consist of anywhere from two to over 100 TIFF files; (3) there are a fair number of emails counted multiple times (probably due to the same email being forwarded to multiple King County addresses); (4) a very large number of the emails arrived at King County after the decision was made on December 23; and (5) at least 3,008 individual emails arrived at King County offices on December 23rd between 11:00 a.m. and 4:00 p.m. as a result of a mass appeal from the powerful Texas based group “Christians United for Israel,” all these emails being 100 percent identical except for the name on the very last line (in fact, this group claims to have generated nearly 6,000 emails in this short period of time). Estimating the real number of emails will require further analysis, but it is now clear that King County's claim of over 6,000 emails creating concern will probably end up as less than 2,000 (not all of which were against the ads). The US Campaign's member organization in Olympia, Washington, has announced its schedule of events for Friday and Saturday, April 8 and 9. It's not too late to register for the 2011 Peace Works conference, featuring keynote speaker Alice Walker. Look at the full program here. Campus Divestment Strategies with students from the divestment campaigns at UC Berkeley, Evergreen, and Hampshire Colleges. From Actions to Campaign: Choosing your BDS Target with Israeli founder of Who Profits? Dr. Dalit Baum and Palestinian Human Rights Attorney Noura Erakat. Power, Privilege, and the Politics of Cross-Movement Building with members of Palestinian Queers for BDS, the Indigenous youth delegation to Palestine, and more. Combating Misused Charges of Anti-Semitism and Challenging Jewish Privilege with Rabbi Lynn Gottlieb and Sarah Kershnar. How to Talk the Walk: Constructing & Deconstructing the Discourse on Palestine/Israel with members of Olympia and Philly BDS. Food as a Weapon and a Solution: Food Justice for Palestine with members of Canaan Fair Trade, Students United for Palestinian Equal Rights and an urban Seattle farmer. Hip Hop: A Tool for Liberation with Seattle-based Emcee Gabriel Teodros. Beating the Backlash: Winning in Victory, Winning in Defeat with members of the Seattle Mideast Awareness Campaign, MN Break the Bonds, and Olympia BDS. Faith in Action: BDS and Faith-Based Solidarity with Rabbi Lynn Gottlieb, Taher Herzallah and Yvonne Turner. What started out as a question of whether the Sacramento Natural Foods Co-op should stop carrying certain products based on human rights considerations has now become a matter affecting the Co-op’s very democracy. In an effort prevent the Co-op’s members from voting on this issue, the Co-op Board has eliminate its long standing boycott policy, done away with Open comments at Board meetings, and is seeking to eviscerate member’s ability to put initiatives before a vote of the full membership as provided in the Co-op’s Bylaws. All of this while it discusses major policy changes at private meetings with no member input. Today, setting a worldwide precedent in the academic boycott of Israel, the University of Johannesburg (UJ) has effectively severed ties with Israel’s Ben-Gurion University (BGU). This was after UJ’s Senate rejected a last ditch motion by pro-Israeli lobbyists to have two separate bilateral agreements - one with a Palestinian University and another with an Israeli University. UJ chose instead to uphold its previous Senate Resolution that required taking leadership from Palestinian universities. Palestinian universities unanimously rejected any collaboration with BGU (in any form) and have come out in full support of the the academic boycott of Israel. UJ chose to respect this. Editor's Note: US to Gaza is one of more than 325 coalition members of the US Campaign to End the Israeli Occupation. According to the Israeli newspaper Haaretz, the Israeli government is "launching a public campaign" today, March 22, 2011 aimed at stopping the planned International Freedom Flotilla set to sail this spring. This news comes on the heels of information that the Israeli Defense Force (IDF) announced it has formed a special unit to "monitor" foreign nationals opposed to its policies, including the flotilla. The U.S. Boat to Gaza project has been organizing a boat called The Audacity of Hope that will be one of the approximately 15 boats that will sail to Gaza with people from over 22 countries. This non-violent, international flotilla will be sailing close to the one year anniversary of a flotilla that was brutally attacked by the IDF, killing nine people and injuring many more. Organizers of The Audacity of Hope are outraged that the Israeli government is monitoring people in this country, as well as other nations, who are doing nothing illegal or threatening to that government. "If the Israeli government is worried about so-called "delegitimization" they should put an end to their immoral siege against the people of Gaza. Instead of monitoring people in other countries, the Israeli government should be ending their illegal, counterproductive, and often violent policies towards Palestinians and internationals protesting peacefully," said Gail Miller, one of the organizers. "Israeli authorities seem intent on silencing dissent from within and without. If Israel believes that infiltrating, spying on, and perhaps once again attacking, un-armed human rights advocates in international waters or elsewhere is going to serve Israel’s interest or lessen criticism of its unsustainable policies they are wrong." Announcement on fan web page could not be confirmed, but the folk legend will reportedly be playing one show at the Ramat Gan Stadium on June 20. Folk legend Bob Dylan is apparently planning to return to Israel for a concert on June 20, according to a fan-run web site. The concert has not yet been confirmed, but the web site reported that Dylan would take the stage for one night at the Ramat Gan Stadium, where Canadian singer Leonard Cohen played in 2009. Dylan has played in Israel twice, in 1987 and 1993. In September 1987, he gave two concerts, on in Tel Aviv's Hayarkon Park and the other at the Sultan's Pool in Jerusalem. In 1993, he played at the Tel Aviv cultural center. Last summer, one of the largest fan sites dedicated to Bob Dylan songs, dylanchords, blocked Israeli IP users access over the Israel Defense Forces' raid on the Gaza –bound Freedom Flotilla. The webpage redirects Israeli web users looking for chords to Dylan's songs to the webmaster's blog. The music site, which supplies guitar chords and tabs of tens of Bob Dylan songs, including news and biographical information for the fervent fans, was founded by Danish music expert Eyolf Østrem several years ago, yet it was closed down in 2005 due to American copyright violations. Since the site was officially shut down, it has run on unofficial mirror versions. Editor's Note: Chernus points to the US Campaign for the second time this month, leading readers to our online tax mapping tool and citing our figure of $21.59, what the average U.S. taxpayer will contribute in military aid to Israel in 2011, now that Barack Obama has nearly succeeded in upping the ante of Israel aid set forth by George W. Bush. In his last year in the White House, George W. Bush promised Israel $30 billion in military aid over the next ten years. Apparently, Barack Obama doesn't think that's quite enough. His new proposed budget ups the ante by $75 million for the next fiscal year. If Congress approves that increase - and when did Israel ever lose in the US Congress? - the average US taxpayer will contribute $21.59 in military aid to Israel in 2011, according to the US Campaign to End the Israeli Occupation. The campaign has a nifty web site feature that will tell you roughly how much your own state, congressional district, county or even city will pay. My rather small, sleepy, middle-American city will give Israel about $1.8 million in military aid next year. I suspect my neighbors will be shocked when they learn about it (in the letter to the editor I'm sending off right away). The web site translates whatever amount you and your neighbors are giving Israel into the equivalent in human services - things like primary medical care, early childhood education and job retraining. But I have a hunch that my neighbors and yours are in no rush to use that money for human services. I bet most of them would stuff the money back into their pockets, until the next impulse strikes to buy the latest gadget they've seen advertised on television (new iPhone anyone?). If, that is, our neighbors really do not want to give the Israeli military their money. But we shouldn't be too quick to assume anything. The average taxpayer will pay about the price of one cup of coffee per month for aid to Israel. And the average taxpayer might just be ready and willing to do that. What does the public really think about aiding Israel? A long Google search turned up shockingly little polling data on the question. The most recent I could find was from 2006, when less than a third of the public thought we should cut military aid to Israel. Half of respondents to the survey thought aid should be maintained at its current level and 12 percent wanted it increased. In the absence of more recent data, we have to rely on anecdotal impressions. When Bush announced his massive long-term commitment to the Israeli military, there was little public outcry. More recently, Sen. Rand Paul's (R-Kentucky) suggestion to cut military aid to Israel gained little traction. It's easy to credit that relative public silence to the power of the right-wing Israel lobby, but that would be a dangerous oversimplification. Consider a few more relevant statistics. In early February, Gallup asked a cross section of the American public two questions: "What is your overall opinion of ... " followed by a list of countries, and "How important do you think what happens in each of the following countries is to the United States today?" The results show an interesting correlation. Of the nine countries topping the list of "vitally important" to the US, eight get less than 50 percent favorable ratings and are generally seen as actual or potential sources of trouble to the US (which is, presumably, why people think they matter to us). The only nation with a strong favorable rating that also ranks high on the importance list is Israel. On the "importance to the US" scale, Israel places fourth, with 54 percent calling events there vital and another 32 percent seeing them as important but not vital. A mere 10 percent said what happens in Israel is not important to the US. The 54 percent number is virtually unchanged from the same poll four years ago. That's not surprising. Did you notice, as the uprising in Egypt unfolded, the steady flow of news items devoted to the reaction in Israel? How many items did you see about the reaction in, say, China or India or the rest of Africa - all of which are arguably a lot more important to the world's future than the reaction in Israel. But Americans are conditioned by their media to assume that Israel is of vital world importance. All these statistics add up to a pretty simple picture, which matches the picture painted by most of the US mass media over and over again: Israel is a likeable nation, its neighbors are a lot less likeable and what happens in Israel matters a great deal to Americans. To me, that's a recipe for a public inclined to spend that cup of coffee's worth each month to help Israel - especially when you fill it out with the rest of the dominant media picture: since Israel is more admired than its neighbors, it is readily seen as an innocent "good guy" while its neighbors are seen as evildoers bent on destroying Israel. And if Israel disappears, we're told, the Middle East will be overrun by anti-American forces. So Israel needs that military aid to defend both itself and US interests in the region. The mass media rarely come out and say it so bluntly (except perhaps for Fox News). But that simplistic narrative has been assumed between the lines in most American reporting on Israel for decades. Across this country, there's a widespread, deep-rooted, taken-for-granted story about Israel as a tiny nation that deserves military aid because it's surrounded by huge enemies bent on destroying it. "Ein breira," the Israelis have said (in Hebrew) for years: we have no choice. We really hate doing this stuff. But when someone wants to destroy you, all the normal moral rules no longer apply. You do what you must to survive. And vast numbers of Americans assume the Israelis are telling it like it is. In fact, of course, the popular narrative is totally out of touch with reality. But how many Americans know that? Not nearly enough to mobilize public opinion for cutting aid to Israel. Here's where the groups promoting that aid cut make their mistake. They know that the popular narrative is nonsense at best. For them, that goes without saying. So they don't say it; they don't attack the narrative head-on. Instead, they work hard to educate the public about all the human rights abuses and other morally outrageous things that Israel does with the weapons our tax money provides. The public already knows what's going on, though. They see it all on television. The problem is that they don't define it as outrageous or abusive. What counts as a human rights abuse, or as moral outrage? It depends on the context. Suppose you strike out at someone who is menacing you or your child. Isn't that just self-defense? Even a lot of progressives would say so. And that's how most Americans see Israel's use of force and offenses against human rights. In fact, many admire the Israelis as rough, tough guys who do what they must in an amoral international jungle. The way to change public opinion is not to pile up more and more facts, but to change the narrative through which those facts are interpreted. That means a full-scale campaign to discredit and debunk the story of Israel as an innocent, endangered victim, while promoting a more accurate story of Israel as the regional superpower, already fully secure against attack. It's a huge task to change a long-entrenched public narrative. But until that change comes, the military aid will keep on flowing, Israel will have little incentive to negotiate a just peace, and Palestinians will keep on suffering. In Israel and Palestine, it has long been assumed that the conflict is, at heart, a battle between conflicting narratives. It's time to bring that conflict to American soil. FOOD! MUSIC! INSPIRATIONAL SPEAKERS! DISCUSSION! This will allow us to help a group of around 20 people travel! Download and print the event flyer here. The African Heritage Delegation will raise awareness, heighten activism, and further link struggles between African Heritage communities in the US and those working for justice in Israel/Palestine. Given the racism directed towards Palestinians and other communities of color in the Middle East, the growth of the boycott, divestment and sanctions movement, and the mounting relevance of an Apartheid analogy to Israeli policies, voices of African Heritage communities are increasingly important to strengthen and support struggles for justice in the Middle East. The delegation will: Exchange lessons learned from Black Power, Civil Rights, anti-apartheid and anti-racist, pro-justice, struggles in the US with those waging similar campaigns in Palestine/Israel; strengthen a cadre of African Heritage leaders who have on-the-ground experience in Israel/Palestine; and further link activism in African Heritage communities with peace and justice work in other communities. This program is built upon existing efforts within African Heritage communities and will strengthen work focusing on Apartheid in Israel, justice in Palestine, and the growth of boycott, divestment and sanctions campaigns nationally. Nothing can do more to amplify such voices than an on-the-ground experience which will allow you the chance to develop strong and lasting relationships with Palestinian and Israeli activists. The Israeli government’s repression of the boycott, divestment and sanctions (BDS) movement is growing ever more harsh. Domestically, earlier this month, "the Knesset plenum…approved in its first reading a 'boycott law,’ which would levy harsh punitive fines on Israelis who call for academic or economic boycotts against Israeli institutions," according to Ha’aretz. While the anti-boycott bill is aimed at shutting up internal Israeli calls for BDS, much more punitive measures continue to be inflicted on Palestinian activists. Jesse Rosenfeld, reporting for Alternet, has an exclusive report on the alleged torture of Mohammad Othman, a key organizer in the non-violent resistance campaign against the West Bank separation barrier. After returning from Norway in 2009, where he met with "Norwegian socialist movements and BDS activists, as well as members of the national Parliament, including the Norwegian finance minister," Othman was arrested at the West Bank-Jordan border. The interview with Rosenfeld marks the first time Othman has spoken out about his conditions in prison. Editor's Note: JVP is among more than 325 member groups of the US Campaign to End the Israeli Occupation, of which several have recently voiced support for Miral, a film opening this week in New York and Los Angeles. As supporters of Jewish Voice for Peace, an organization inspired by the Jewish tradition of working for social justice, equality and human rights, we are committed to a just peace between Palestinians and Israelis that is based on the tenets of democracy and international law. We also believe that only by understanding both Jewish and Palestinian narratives can we ever hope to reach a lasting peace and mutual understanding. For these reasons we oppose attempts by the American Jewish Committee and the Israeli government to cancel the premiere of the film Miral, which is scheduled to take place at the United Nations in New York this evening. The film, based on the autobiographical novel of Palestinian journalist Rula Jebreal, was made by Jewish-American director Julian Schnabel. He says he was inspired to make the film because of his own family history and commitment to a just peace. The American Jewish Committee has said the cancellation is justified because the film “portrays Israel in a highly negative light.” We believe this is part of a deeper pattern of reactively muzzling perceived criticism of Israeli polices and human rights violations. This attempt to prevent an audience from making up their own minds about the content of a commercial film, no matter how difficult or flawed, does an injustice to the core Jewish and human values for which millions of Jews and Israelis around the world stand. As American Jews, we know the power of telling our own stories of exile and terrible loss. Palestinians should also be able to tell and see their stories, no matter how painful, without calls for censorship or charges that doing so threatens Jewish identity. Nadia Hijab is a member of the US Campaign's Advisory Board, and one of its co-founders. She gave the following speech last Sunday, March 13, at the Jewish Voice for Peace meeting in Philadelphia. Hijab is also co-Director of Al-Shabaka, The Palestinian Policy Network. I want to talk about the messages from the Arab revolutions, how we can stay mobilized as a movement, and the opening for new relations between Jews and Arabs. I know we’ve all been transfixed by the Arab revolutions, and I want to highlight a couple of messages beyond what they mean for our Israel-Palestine work. The Arab revolutions are about the people of each country putting their house in order. They’re not being isolationist – look at how the Tunisians, with their own revolution still underway, rushed to help the Libyans. But if peoples do not put their own house in order, they can’t play a positive role outside their borders. And their governments find it easier to hijack their foreign policy. Another powerful message the Arab revolutions are sending is that democracy is not just about elections every few years It’s also about making the links between political, economic and social rights – between bread, dignity, and freedom. These messages from the Arab world – which is where I grew up and where I still feel I belong – tell me how incomplete democracy is in America. And one of the reasons it is incomplete is because the link between economic, political, and social rights keeps getting broken. When people are struggling to survive the repeated disastrous recessions that sweep away their homes, jobs, services, and labor rights, how can they question the crimes their country is committing abroad? And how can they challenge the government they have at home, and the way it’s bailing out the banks of the rich with the tax money of the poor? America needs to put its own house in order. We need an America that doesn’t just preach democracy abroad but practices it at home. We need an America that doesn’t project moral superiority and see itself as the world’s policeman in control of other countries’ strategic resources - but an America that deals with other countries as equals. Founder and Executive Director of our San Mateo, CA, member organization, "Rebuilding Alliance," Donna Baranski-Walker, today announced an "eleventh hour" victory in reaching the $12,123 goal for the organization's latest project, "Teaching in Village Under Demolition Orders." The project focuses on the children of the West Bank village of Al-Aqaba, whose future is threatened because of demolition orders that were issued by the Israeli military against the whole village, including the kindergarten. The village struggles to fund salaries for teachers and staff because of widespread poverty. "Thanks to all the 71 donations, this project will be a success. … The next Bonus Day challenge is on June 15th -- let's do it again in June. 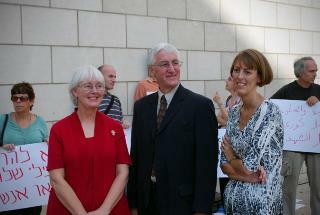 Thank you for remembering the late Rachel Corrie with us. We believe this project embodies the community building, education and action so important to her." Yesterday, March 17, Baranski-Walker also published in the Huffington Post "An Open Letter to the Department of State, in Response to the U.S. Human Rights Report." This event was held on March 11 at Judson Memorial Church in Manhattan, as part of Israeli Apartheid Week (IAW) in NYC. John Greyson, Judith Butler and Jasbir Puar discussed new forms of activism in support of the Boycott, Divestment, and Sanctions (BDS) movement against Israel, focusing on both the cultural and academic boycott and the importance of queer BDS activism in Palestine and elsewhere. "How Now BDS" centered on how BDS is done now, and what must still be done. The panelists also discussed the NYC LGBT Center’s controversial decision to cancel the IAW event “Party to End Apartheid,” and to ban the event organizers Siegebusters from holding its meetings there. Today, AJJP became the first Jewish organization in the United States to stand up against the AJC and the Government of Israel in their efforts to stop the showing of the new film "Miral" at the United Nations this evening. You can learn more about the film at www.miralmovie.com and share the unprecedented statements being issued from the entertainment industry on the need to hear both sides of the story: www.thedailybeast.com. We, at American Jews For A Just Peace, www.ajjp.org, stand in support of filmmaker Julian Schnabel and Harvey Weinstein in their efforts to distribute Miral, a new film based on the autobiographical novel by Palestinian journalist Rula Jebreal. Miral tells the story of three generations of Palestinian women, and in particular an orphaned Palestinian girl, as they navigate the personal and political landscapes of their times, starting with the creation of the state of Israel in 1948, through the first nonviolent Palestinian uprising against Israel's occupation of the West Bank and Gaza Strip in 1987, to the signing of the Oslo Accords in 1993. Miral is not a documentary or a polemic; it is a window into the lives of Palestinians, whose voices have gone unheard in the United States for far too long. We, at American Jews For Just Peace, stand in opposition to the efforts by the American Jewish Congress and the Israeli government's efforts to block the film's showing at the United Nations and other venues. The following article by Julian Schnabel and Harvey Weinstein was published by The Daily Beast on 12 March 2011. "Peter King Needs to See Our Movie"
At a time when politicians are stoking the flames of hate, we felt the need to make a film about understanding the Palestinian narrative. Perhaps predictably, our critics are furious. Two events taking place within weeks of each other this month illustrate the complex and sometimes difficult history of Arabs and Muslims in America. On Thursday, Congress launched an investigation into the American-Muslim community that many observers have likened to a McCarthyite witch-hunt, and on March 25, Miral, a mainstream American film with a Palestinian protagonist, will have its U.S. theatrical premiere in New York and Los Angeles. The U.S. Boat to Gaza, THE AUDACITY OF HOPE, is committed to breaking the siege of Gaza by sailing a U.S. flagged ship in the International Freedom Flotilla this May. Around the country thousands of people have been contributing, organizing, fundraising, and preparing to support THE AUDACITY OF HOPE. Not everyone can sail on the boat, but you all are just as much a part of the campaign as the passengers and the crew. We are happy to announce the launch of an exciting new effort -- To Gaza with Love -- to collect letters from people in the U.S. to the people of Gaza. Your letters will be precious cargo on the ship. THE AUDACITY OF HOPE will challenge the complicity of the U.S. government in the isolation and imprisonment of 1.5 million Palestinians in Gaza. We are committed to breaking our government's support of the brutal Israeli military and policies of "delegitimizing" Palestine and destroying Palestinian life. This campaign will add to those voices actively breaking the silence and confronting the lies and distortions. The blockade is not just a blockade on goods, but also on human contact and communication. Your personal message will reach people who have literally been imprisoned by the Israeli siege and blockade. Your letters will build solidarity and make a human connection. They will convey our dedication to ending the Israeli occupation, and the liberation of Palestine guided by international law, justice and human rights. Already mothers, farmers, teachers, students, cab drivers and artists are writing. Whether it's a letter from a U.S. mother to a mother in Gaza, a child in the U.S. to a child in Gaza, or letters from students, teachers, business people, religious leaders to their counterparts in Gaza, the siege cannot withstand the power of our words to break through. Alice Walker talked about the radical power of love to create change. The campaign To Gaza with Love allows you and thousands of other people to be part of that change. Please write your letter today. Write a letter and then encourage your friends and family to join this collective action of friendship and solidarity with the Palestinian people. Organize letter writing parties in your home, school or place of worship. You can simply write a few lines on a postcard, a few paragraphs on paper or a card, or film a short video clip. Be creative. The only restriction is we need to be able to get it to Gaza. If you do a sculpture or a wall mural, you will have to send us a picture, not the real thing. When THE AUDACITY OF HOPE sails, your letters and messages will be part of its cargo. Meanwhile, we will send some of these messages right away and make them public through Twitter, Facebook, on our website, and in statements to the press. We'd also like to archive them and create an exhibit or book. Get on board the U.S. to Gaza Campaign. Visit WWW.USTOGAZA.ORG to endorse and contribute. Wednesday, March 16th, we mark the eighth anniversary of Rachel Corrie's stand in Rafah to protect the home of a Gazan family and for the right of all Palestinians to be free of occupation. Here in Rachel's hometown, we will mark the day with an event emphasizing community-building, education, and action - all key to Rachel's organizing here and beyond. We will continue a tradition of sharing a potluck meal, music, and spoken word and will hear from Cindy and Craig Corrie about the continuing civil trial in Israel in Rachel's case. We will focus on our friends in Gaza who, according to the The UN Office of Coordination of Humanitarian Affairs (OCHA) continue to suffer death, injury, and severe restriction on imports, exports, and freedom of movement. We will continue our demands for an end to the collective punishment of the 1.7 million residents of Gaza and to the blockade and siege. See the OCHA Report Here. We will, also, remember and salute the courageous activists whose lives have been claimed this past year in nonviolent actions against Israeli policies or who have found themselves in prison because of their nonviolent resistance. They are American, Palestinian, Turkish, Israeli, and from elsewhere. In keeping with our memory of Rachel, we will this March 16th continue to listen to the voices of young people as they struggle worldwide to assert their visions for a democratic, free, and peaceful future; and we will call on U.S. officials to listen, too, and to be consistent in their demands that foreign governments and militaries be accountable for their actions and respect the right of people to assemble and protest. We have heard from many across the U.S. and world who plan commemorative events. We thank all who join us in remembering Rachel and ask that you focus, too, on the others who have stood and been struck down, those imprisoned for their nonviolent resistance, those who carry on the work, and those in Gaza for whom Rachel took her stand. With events this week and beyond that keep compassion, humility, and love at their core, we will all honor Rachel's commitment and spirit. The Corrie family has recently received word that the civil lawsuit in Haifa District Court in Israel in the case of their daughter Rachel Corrie, will resume in early April with court dates currently scheduled for April 3 and 6. Six state's witnesses remain to testify, including commanders who were in charge when Rachel Corrie was killed in 2003. For trial information and updates as it develops, please click here. Three resolutions taking critical positions towards Israel were adopted by the United Methodist Church’s public policy arm during its recent meeting. Members of the General Board on Church and Society (GBCS) voted in favor of resolutions seeking boycotts and divestment directed against companies regarded as complicit in the Israeli presence in the West Bank. Meeting February 9-13 at a United Methodist retreat center outside Orlando, Florida, the 63-member board also voted to affiliate the church agency with the U.S. Campaign to End the Israeli Occupation. GBCS has a history of adopting anti-Israel and pro-Palestinian resolutions. While the church agency seeks to portray itself as a fair broker in Middle East matters, it has adopted no resolutions that are critical of Palestinian groups such as Hamas, or of neighboring Arab dictatorships like Syria. In 2009 GBCS hosted an event at its Capitol Hill headquarters in which speakers portrayed Israel’s founding as a disaster. Editor's Note: The Minnesota Break the Bonds Campaign is a member group of the US Campaign to End the Israeli Occupation. On Thursday, March 3, more than 40 Break the Bonds Campaigners and supporters packed the quarterly Minnesota State Board of Investments meeting to declare that the people of Minnesota do not want their money funding Israel's actions. Although they were not officially given a spot on the agenda, a group of BBCers were able to read legal and moral arguments for divestment of Minnesota money from Israel Bonds and thus Israeli atrocities. MN BBC was represented at the meeting by students, teachers, lawyers, journalists, parents, Jews, Christians, Muslims, Palestinian refugees, professionals, lay people and more. Editor's Note: The US Campaign has previously worked with its member organizations Adalah-NY, CODEPINK and Jewish Voice for Peace to persuade the U.S. State Department to apply pressure upon the Israeli government to release one of its highest-profile prisoners of conscience, Abdallah Abu Rahmah. Today we all celebrate Abu Rahmah's release and renew our pledge to continue calling upon our government to use its special relationship with Israel to secure the release of all other Palestinian political prisoners still languishing in Israeli jails under outrageous sentences for organizing nonviolent resistance in their communities. A Palestinian activist jailed for organising weekly demonstrations against Israel's separation barrier was freed on Monday after 15 months behind bars. Abdullah Abu Rahma was one of the chief organisers of weekly demonstrations in Bilin that have come to symbolise the Palestinian fight against the vast separation barrier Israel is building across the West Bank. Abu Rahma was met by scores of family members, friends and supporters as he walked out of Ofer military prison near the West Bank town of Ramallah, an AFP correspondent said. He was arrested in December 2009 and convicted eight months later of incitement and organising and participating in the protests in Bilin village, west of Ramallah, that are regularly attended by scores of Palestinian, Israeli and foreign activists. But he was acquitted on charges of stone-throwing and weapons possession for exhibiting spent tear-gas canisters fired by Israeli troops. He was released after serving more than 15 months and still has several weeks of remand time, meaning he risks going back to jail if he participates in or organises any demonstrations, or says anything considered as incitement. "All these arrests and the killing will not prevent us from continuing our struggle against the occupation and against the wall," Abu Rahma told AFP shortly after his release. "Whatever they do, we will continue," he said, while bringing "a message" from the Palestinian prisoners: "Continue the public struggle against the occupation and the struggle to reach national unity. Our first and only enemy is the occupation." His conviction in 2009 prompted human rights groups and officials including European Union foreign policy chief Catherine Ashton to express concern. Abu Rahma's lawyer, Gaby Laskey, described him as "an important part of the non-violent movement against the occupation," and said she was happy to see his release. "I believe that the charges against Abu Rahma and his sentence were of a political nature to try and put an end to the non-violent demonstrations in Bilin," she told AFP. "His being in jail did not stop the demonstrations, it actually encouraged people to go out and demonstrate more for their cause." The protests are billed as non-violent though Palestinian youths often hurl stones at Israeli troops, who respond with tear gas and rubber bullets. A relative of Abu Rahma, Jawaher Abu Rahma, died early on New Year's Day after reportedly inhaling massive amounts of tear gas at a protest in Bilin a day earlier, although the Israeli military denied tear gas was the cause. Israel says the barrier is needed to prevent attacks, but the Palestinians see it as a land grab aimed at stealing chunks of their future state. The keynote speaker at the 2011 University of Oregon Public Interest Environmental Law Conference, Representative Earl Blumenauer (D-OR), caused controversy as members from the audience protested his involvement in both the acclaimed environmental law conference and the American Israel Public Affiars Committee (AIPAC) Oregon chapter meeting. Congressman Blumenauer served as the keynote speaker for both organizations in the same weekend. Halfway through Rep. Blumenauer's speech promoting Portland's bicycle culture, protesters floated a five-by-10-foot banner to the ceiling of the University of Oregon ballroom. The banner read "AIPAC" with an arrow pointing backward and "Enviro Justice" with an arrow pointing forward. The group claims that being in lockstep with AIPAC contradicts environmental values. 500,000) and information about the Israeli bombing of the sewage treatment plant in Gaza resulting in raw sewage contaminating the Mediterranean Sea. questions during the Q&A to prevent protesters from addressing what they call "social and environmental justice contradictions." Rep. Blumenauer received further protest when he arrived at the AIPAC meeting on Sunday in Portland. Over three dozen protesters held signs protesting Israeli actions in the West Bank and Gaza and constructed a mock separation wall. The "Only Democracy in the Middle East"? Hardly. As pro-democracy and freedom movements sweep the region, Israel's policies look more retrograde. Ever since Israel began to transition from a charity case to a strategic partner of the United States--an evolutionary process from the mid-1950s to the early 1970s--its supporters in the U.S. political arena have brandished a variety of arguments to justify the unusually close relationship. From Egyptian President Gamal Abdul Nasser's Czech arms deal and subsequent embrace of the Soviet Union in 1955 until the dissolution of the bipolar superpower system in 1991, Israel's supporters maintained that this Western bastion served U.S. interests by thwarting the advance of Communism in the Middle East. The abrupt end of the Cold War necessitated a new argument, and the rising lethality of transnational terrorism in the 1990s and 2000s provided one: Israel and the United States shared a common enemy and struggle in the "war on terror." In a shell-shocked post-9/11 political environment, this talisman did the trick well for a time. Israeli Prime Minister Ariel Sharon encapsulated this meme just two days after September 11, declaring to Secretary of State Colin Powell that Palestinian Authority President Yasser Arafat "is our Bin Laden." Editor's Note: For recent media coverage of this issue, see Ha'aretz here. Over 50 Israeli civil society organizations have signed an urgent appeal to the Constitution, Las and Justice Committee of the Knesset, calling the committee to halt the legislative proceedings of the Boycott Phrohibition bill. We, the undersigned civil society organizations, emphatically protest against the proposed law “Prohibition on imposing a boycott,” which is now being brought for discussion in the Knesset’s Constitution, Law and Justice Committee. We are not unanimous in our approach to using the boycott tactic; some of us are of the opinion that it is an efficient tool, while others strongly object to its use. Yet we are all united in our stand that it is, indeed, a civilian, non-violent and legitimate tool to express opinion and advance social and political change. As such, it falls within the rules of the game in a democracy. This proposed law is clearly intended to limit the expression of specific opinions and political groups, simply because their protest challenges the current political consensus in Israel. Instead of conducting a democratic discussion of the issues on Israel’s public agenda, the proposed law serves to silence political adversaries and to block public discussion.